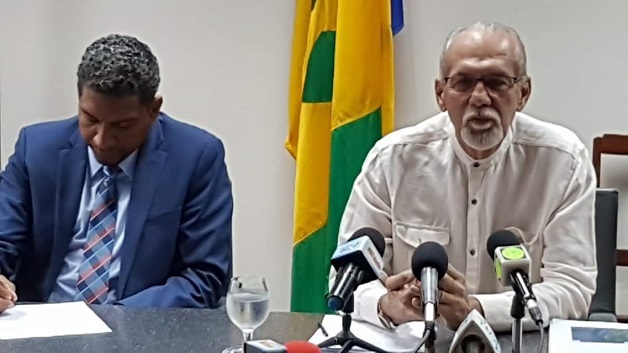 The Construction of the National Agricultural and Feeder roads is expected to get underway soon, following the signing of a contract on at Cabinet Room, between the Ministry of Transport, this country’s Government and the Postal Services. In his remarks at the signing ceremony, Minister of Transport, Works and Housing, Julian Francis said the Government was financed with a loan of 32 million EC dollars, by the Kuwait Fund for Arab Economic Development, for the development of Feeder and Secondary roads across the country. Minister Francis said the Rehabilitation of the North Windward Coast, Road Project will cover 10 roads. The projects, financed by the Kuwait Fund for Arab Economic Development are being rolled out from this year and are expected to significantly contribute to the improvement of roads across St. Vincent.